As the October nights grow longer and colder, we here at FirstNerve Manor—that Gothic pile down at the end of Lonely Street—like to retire to the study, pour ourselves a brandy, and settle down in front of the fire with a classic ghost story. Naturally (or perhaps unnaturally) our favorites involve specters that announce themselves by smell. Smells are haunting in more ways than one: they are invisible, they sneak up on you, and they can disappear quickly. Smells go hand in glove with faded memories, lost love, fear, anxiety, and unfulfillable yearnings. One of the volumes we dust off this time of year is The Uninvited, a 1942 novel by Dorothy Macardle. Set in England in the 1930s, the story centers on Cliff End, an old seaside house in Devonshire. Owned by Commander Meredith, a retired naval officer, it has been empty since the death of his sainted daughter Mary some fifteen years earlier. He now lives in the nearby town with his grand-daughter Stella. The girl’s father, the debauched painter Llewellyn Meredith, died some years after his wife. The story’s narrator is Roderick “Roddy” Fitzgerald a young but well-established literary critic who is looking to make a break from the London scene. He wants to find a place in the country to live with his sister Pamela who needs to recuperate after six years spent caring for their late, ailing father. The siblings happen upon Cliff End and convince the reluctant Commander to sell it. Roddy is charmed by Stella who is a strange mix of upright formality and girlish warmth. Soon enough the new owners experience supernatural “disturbances”—moaning, sobbing voices, vaporous apparitions, cold air, and the sweet smell of Parfum Mimosa. The locals believe these are the caused by the uneasy spirit of Mary Meredith who was killed in a suspicious fall from the cliff. The incident involved a beautiful and mercurial Spanish woman named Carmel, who was Llewellyn’s artist model and more. Stella worships the memory of her mother and wears Parfum Mimosa herself. The fact that she and the Fitzgeralds associate the spectral perfume with comforting and warm emotions (in contrast to the terrifying, fog-like ghost that also visits) is an early clue that the haunting of Cliff End is the result of dueling spirits. The plot involves lots of characters and plenty of misdirection. There’s Father Anson the priest who recommends exorcism, Lizzie Flynn, the Fitzgerald’s longtime cook and housekeeper, Dr. Scott the socially inept town doctor who’s soft on Pamela, and the daunting Miss Holloway, proprietor of the Centre of Healing through Harmony who was a nurse to Mary Meredith and later Stella’s governess. Roderick and his sister go down several blind alleys in their attempts to unravel the mystery—which become more desperate once Roderick falls in love with Stella and the Commander decides to send her away. Parfum Mimosa—its sweet floral character, its origins, and its mood effects—is one of the keys that eventually reveals the true identities of the story’s ghosts. Macardle deftly weaves the perfume into the story, along with occasional other smells that bring the local settings to life. Perhaps because it’s a British novel of a certain vintage, the characters do an enormous amount of eating, drinking and smoking. It’s a hard book to read without having something handy to munch on . . . 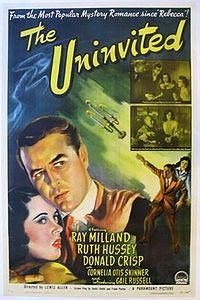 In 1944 The Uninivited was made into a movie starring Ray Milland and Ruth Hussey as the Fitzgeralds and Gail Russell as Stella. The film score by Victor Young included the instrumental theme song Stella by Starlight. Ned Washington set lyrics to it a couple of years later and it’s been a jazz standard ever since. Ray Milland would of course go on to other heights...aha, "heights"...when he starred with Rosie Greer in "The Man With Two Heads." Wonder what their noses knew? Thanks for hepping me to the film and the music trivia.